We visited the most famous Weaving Team in the village. This team is, in fact, the most celebrated in all of Thailand. They execute only bespoke weaving, creating unique items in designs drawn by the Famous Artist who also owns the Team. The first image is a view into the large hall that contaims 5 looms. 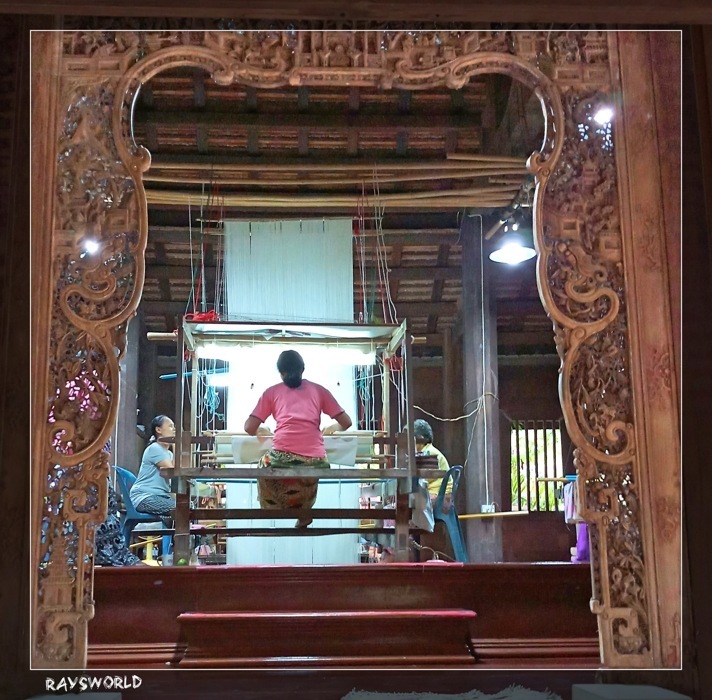 You can see one loom, operated by the woman in the pink shirt who is assisted by two Programmers who have the intricate task of interpreting the Artist's design according to the verry complex program that is the string, knots and bamboo slivers shown in the second image. There is a deep bacement below the hall of looms...we went down to see what was there, and discovered another Weever's assistant who had responsibility for keeping the program from becoming tangled. Ray: It is...and I will include it on my customized tour for you when you wist, Elizabeth. Ray: Leur produit se vend à plus de US$2,000/met, Martine ... chaque commission donne lieu à un chef-d'œuvre unique ... Je pense que c'est un travail d'amour pour les travailleurs. Ray: I do not get bored by repeated visits to this place, Rob. Ce doit être un spectacle impressionnant de pouvoir visiter un tel endroit ! Ray: L'atelier se trouve à l'intérieur d'un très vieux jardin thaïlandais traditionnel et tout dans cet endroit suggère une approche détendue et sans hâte de l'ancien métier, Claudine. What an intricate exercise this is..
Ray: Oh yes...their work is World's Best, Chris. Ray: They are well paid, by Thai standards, Lisl, but it is a labour of love also, and the women of this village he been doing this work for 30 generations or more. Fascinating stuff. No doubt the finished product is spectacular - and probably reflected in the price. Ray: Each piece is a commissioned work, Alan, and sells for around US$2000/meter...way out of my price point. I can’t get my head around this work Ray. Ray: Then it is a good thing you are not the loom operator, Chad. I imagine the goods they produce command a high price Ray. I wonder how much of it comes the way of this team? Ray: All work is bespoke, Bill, and there is at least a 6month wait...there are 5 looms fully employed. Pretty costly, too, I imagine! Ray: Think US$2000/meter, Tom...that is at least 60 times the normal price for quality silk cloth from this region. I remember you taking us to some silk weavers before. Was this the same place? Ray: Yes...I have shown this place before. I am adding some more pics and information to the story, and will probably do it again in another year or so. This place fascinates me. What amazing talent it must take to do this art, Ray, along with years of training I would imagine. Ray: This Village has specialized in Silk Weaving for many generations, and this team is the most highly regarded in all of Thailand. It is likely these women have been performing this work since about age 12, and their mothers and grandmothers did it deform them. So it seems very loom is operated by a team rather than an individual. Ray: This is true, Brian, mainly because the design in the material is unique for each commissioned work and is so complex that it occupies the time of most members of the team. For simple, repeated designs that are produced by most weavers in Thailand, the resign is committed to the memory of the solo loom operator. Ray: I love visiting this place, Peter...one of my past occupations was as a Computer Programmer, and this loom works with an ancient form of program.